How does a transdermal patch work? The transdermal method consisting in the delivery of active substances (supplements, hormones, medicines) through the skin. The components of the patch are released systematically, owing to which their concentration in the body remains constant throughout the whole period of application. The result of it is a high level of substances supplied to the body, no jumps in their concentration and good tolerance. The quality of each method is proven by tests on a large group of people. In the case of this method of delivery of a supplement or a drug, the effectiveness is very high. The favorable results are boosted by the frequency of the patch change – this is an undoubted advantage over taking capsules or tablets, it also limits the possibility of making a dosage error. You may also encounter transdermal patches with testosterone, with anti-inflammatory drugs, anesthetics, anti-hypertension or motion sickness, and recently also for example against Parkinson’s disease, Alzheimer’s disease and depression. 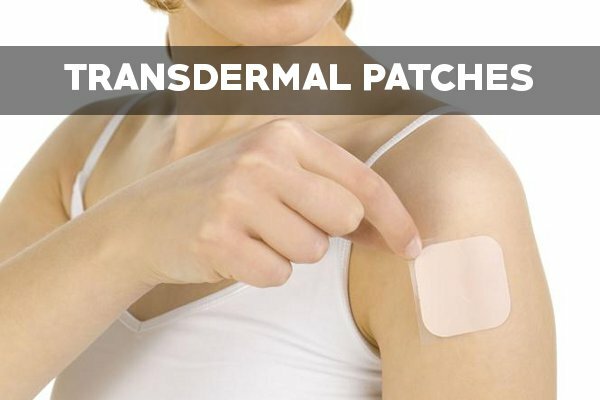 How should the transdermal patch be used correctly? From the point of view of the effectiveness of the transdermal method, proper skin preparation is very important. Make sure that the skin on which the patch will be applied is degreased (e.g. with an alcohol solution), dry, clean, healthy and hairless. It’s advisable not to use any creams, balms, ointments or topical medications onto the skin area, where you want to stick a patch,. This also applies to cosmetics containing oils (eg argan), shea butter and others, which may deteriorate the adhesion of the patch. Properly prepared skin gives us the confidence that the patch will adhere well and fulfill its task. Where should the transdermal patch be applied? The transdermal patch can be applied anywhere, but the three places proven as the best are the shoulder, abdomen or the buttocks. It is important not to stick the patch twice in the same place. This does not mean that you need to change the body part every time – just stick it a few centimeters lower, higher or near. Sticking the patch is very simple – one need to hold the patch with a warm and dry hand for at least 30 seconds. Sliminazer ( RevitaPharm ) – How do these slimming patches work? How effective is the transdermal slimming patch? Comparing the use of this method with the traditional intake of supplements in the form of capsules, we can speak of a fundamental difference both in terms of the amount of active ingredients supplied and their effect over time. The high efficiency of slimming patches is influenced by omitting the gastrointestinal tract – delivering the supplement directly to the body – increasing the amount of substances actually delivered and ensuring continuous operation. The slimming process is carried out continuously and not as it takes place in the case of capsules. The transdermary method is very popular in the case of supplying hormones. Contraceptive patches have been known for many years and are now very popular. They are very effective and easy to use. Thanks to the fact that they are most often changed once a week, they are very convenient to use and limit the risk of making mistakes by a woman who uses hormonal contraception in this form. How effective is a trivalent contraceptive patch? The effectiveness of each contraceptive method is measured with the so-called Pearl indicator. This ratio is very low – it is 0.76 – which means that the patches are a highly effective method of contraception. You can read more about this topic in the article: 6 questions about the contraceptive patch – transdermal contraception. Trandotherapeutic painkillers may heat up or cool. The warming ones contain pepper extracts and / or hot pepper, which cause local vasodilation and thus reduce pain. They are used for releving muscle pains, neuralgia, root inflammation, neuralgia, and lumbago. One patch works up to 2 days. The cooling type contains menthol and extracts of herbs with anti-inflammatory effect. They relieve pain and swelling after injury or fracture. They are stuck for 2-8 hours. The gel’s healing coating protects the skin from drying and chafing. For people suffering from cancer pain, morphine-containing patches are used. There are also opioid analgesics (ie similar to morphine) – buprenorphine (Transtec) or phenanth (Durogesic, Fentahexal, Fenantyl TTS). They are used in the treatment of chronic, severe pains resistant to other agents, including cancer pains. The patch is changed every 3 days. Available only on special prescription. Kostrzewa-Itrych, Anna, and Bartosz Itrych. “The importance of medicine form in treating chronic and breakthrough pain based on morphine, fentanyl and buprenorphine preparations” Farm Wsp 1 (2011): 14-25.